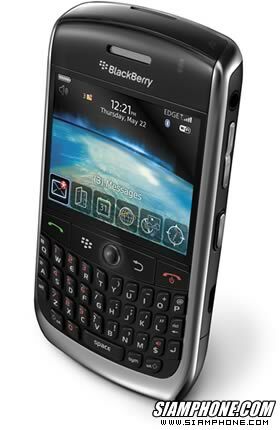 วันนี้หน้ามืดสั่ง BlackBerry Curve 8900 สองเครื่องพร้อมกันเลย ให้ตัวเองเครื่องนึง กิฟท์เครื่องนึง แหะๆ ที่ต้องการเปลี่ยนมือถือเพราะตอนนี้ความต้องการใช้โทรศัพท์เปลี่ยนไปแล้ว กอล์ฟอยากได้เครื่องที่ออนไลน์ได้ตลอดเวลา และเผอิญรู้มาว่า T-Mobile มันลดราคาอยู่ ก็เลยลองเข้าไปดูบนเว็บ ปรากฏว่า ราคาเต็ม 500 เหรียญ (ถ้าเป็นที่ BestBuy ขายอยู่ที่ 600 เหรียญ) นะครับ แต่ช่วงนี้มีโปรโมชั่น สำหรับลูกค้าใหม่ ลดทันที 200 เหรียญ แล้วก็ Mail-in Rebate ให้เงินคืนอีก 100 เหรียญ ถ้าเปิดเบอร์และลงทะเบียนกับ T-Mobile และต้องเซ็นสัญญา อย่างน้อย 2 ปีขึ้นไป สรุปถ้าเป็นลูกค้าใหม่ต้องการเปิดเบอร์ใหม่ จะซื้อ Curve 8900 ในราคาเพียง 200 เหรียญเท่านั้น หรือ ประมาณ 7 พันบาท โอ้วมายก๊อดดด..
พอกลับมาบ้าน เล่าให้กิฟท์ฟัง พอได้ยินผ่อนจ่ายเท่านั้นล่ะ อยากได้ด้วยเลย ก็เลยโทรไปสั่งเพิ่มอีกเครื่อง กลายเป็น ครอบครัว BlackBerry ไปซะแล้ว!! BlackBerry Curve from the US will work just fine with all network in Thailand na krub. I have read that many people used it without any problems. The users can read and type in Thai. or visit http://www.pdamobiz.com and post a thread to their forum. There is a BlackBerry club there and those are Thais who are very helpful. Let me know if you have any other questions na krub. I need more information about your BB na krub. Did you backup all your data before updating it? You might need to try to “wipe handheld” na krub. But.. make sure you have all your data stored in backup before wipint everything out. I will email you if I have more information na krub. AT&T and T-Mobile were like AIS and True na krub. They are mobile service providers krub. They are just different company providing different kinds of technology and marketing plans, packages, and target audiences. You cannot comapre T-Mobile to O2 krub. O2 is a phone, but T-Mobile is not. T-Mobile is just a company. BlackBerry Curve from T-Mobile will be using EDGE technology while BlackBerry from AT&T will be using 3G technology krub. Both BB from either T-Mobile or AT&T should work OK in Thailand. Let me know if you want me to clarify anything else. thank you so much ka. one more question, do you know the difference between IMEI unlocking and PIN unlocking? Thank you for your time answerin my questions ka.. I believe that unlocking the phone is normally unlocking the IMEI. You don’t need to unlock your PIN. Each BB comes with its own PIN number. T-Mobile BB requires users to subscribe BB services so that you can use your BB PIN with the data plan. But, I heard that in Thailand AIS will lock your PIN so you cannot use BB Messenger if you are not signing up their BB service plan. Does it make any sense to you? Call T-Mobile services to unlock your phone. Your sisters in Thailand will need to sign up BB data plan in Thailand in order to use the BB PIN for BB Messenger. I don’t know about in UK na krub, only in the US. You can have your friends purchase BB Curve from any service providers, such as T-Mobile and AT&T. You have to purchase ONLY cellphone without the contract. However, you will have to pay the full retail price which is about $400-$450 now for Curve 8900. Then, you can ask the service providers to UNLOCK the BB Curve for you. They should do that for FREE na krub. Your friends can also purchase the cellphone through their websits na krub. http://www.tmobile.com or http://www.att.com. Update na krub – Now, T-Mobile requires BB buyers to signup their data plan krub. And, AT&T is going to do the same – starting Sept. 6th. So, anyone who wants to buy BB without any contract needs to buy from AT&T stores before September 6th. Hurry up! If your dad pay for that price, $500,it should be BRANDNEW na krub. I guess you can check when you start the bb. It should start from setup wizard. No other personal information on the phone… something like that. I think you can do ANYTHING in Thailand krub. They can unlock the phone for you. Most of the BB phone in the US are registered by the service providers, such as AT&T, T-Mobile, Verizon, etc. It depends on where your dad buy the BB from na krub. You can contact that service provider directly and ask for more information. They should unlock the phone for you .. and it’s free too. Verizon is different from AT&T and T-Mobile na krub. It’s a bit complicated. All the cell phones purchased from Verizon will not have “SIM card” krub. Verizon is using different Network from others. BUT… you can ask Verizon to UNLOCK your SIM card na krub, so that your BB can be used with a SIM card outside the US. However, from what I understand, nothing can’t be done in Thailand. All locked BB can be UNLOCKED in Thailand krub. Do they really have for now? And where can i get that? I’m not sure they will offer monthly BB service na krub. You will need to talk to their customer service. In the US, i will recommend either AT&T or T-Mobile. Sorry for the delay. I’m not sure why ATT did not unlock your BB na krub. I would try to call them back one more time na krub, or visit the AT&T store and tell them about your issue. Make sure you tell them that you will need to use BB in Thailand and you will come back in the US to continue AT&T services again. Are you paying for monthly BB services too? However, I’m pretty sure that you can unlock in Thailand. Once the BB unlocked, you can use anywhere. You can come back and use ATT. But, your BB will fully operate only when you pay BB services na krub. I’m not sure what service plan or package you are using now. I would recommend you to talk to customer service one more time. If you pay their BB service, they should help you unlocked. It’s a business phone. People use BB and travel around the world. You have to be more aggressive krub. Don’t take “No” as an answer krub hahaha! เอ่อ พี่กอล์ฟค่ะ เพื่อนพี่เป้น maneger สาขาไหนค่ะ ?? T-Mobile เดี๋ยวนี้โปรฯเยอะมากครับ ตามไม่ค่อยทัน แต่ที่แน่ๆ ซื้อไม่ติดสัญญาได้ครับ ราคาไม่รวม Tax หรือที่เมืองไทยเรียก Vat บวกเข้าไปประมาณ 8-10% ครับแล้วแต่ว่าไปซื้อที่ไหน ซื้อเสร็จโ่ทรเข้าศูนย์ T-Mobile แจ้งขอโค๊ด unlock ได้เลย แล้วเขาจะ email ให้ภายใน 24 ชม. ก็เลยsearch ใน google เจอบอร์ดของคุณกอล์ฟ ..
คำถามที่สาม .. อยากทราบว่า 8900 เวลาปลดล็อค มีวิธีเดยวหรอคะ คือกดปุ่มด้านบนซ้ายข้างบนเครื่อง นอกจากนี้ มีวิธีปลดล็อคแบบอื่นไหม เช่น ปลดจากแป้นพิมพ์ตัวใดสักปุ่ม ? คำถามที่สี่.. เวลาจะเล่นเน็ตที่บีบี เช่น เฟสบุค เล่นเอ็ม หรือว่า แชทกะคนที่มีบีบี เหมือนกัน ..ต้องทำยังไงอ่ะคะ ต้องไปติดต่อที่ไหนอ่ะ คือเราใช้ซิม วันทูคอล ..แล้วต้องเสียตังแพงไหมคะ ? I am Thai student in UK ka, going to state next Saturday and thinking about buying unlocked BB from US cos it s lot cheaper than UK one. i would love to by Bold 9700 but not sure how it cost in us ka. Could you suggest where to buy and provide a currnet price please. Thanka s lot ka. T-Mobile is selling Bold 9700 both White and Black for $450 (not include tax and without contract). AT&T has the same price. You can buy the phone at Walmart, T-Mobile Store, or AT&T store. You can also ask them to unlock the phone for you. thanks so much for your quick reply ka, Bold is a bit expensive than my expect la ka. may be I will turn to Curve or may be looking for Bold but in Amazon. The price has already been dropped but only for ones who are willing to sign up for 2-years contract. I believe that T-Mobile is selling for $99 with contract and AT&T is selling for $199 with contract. ขอ วิธีทำ อีก ที ได้มั้ ยคะ ? ?